Juan Almendares (JA): I’m going to tell you more or less the areas in which I work, both as a person and with organisations, because I work with organisations. We’re associated with the Centre for Prevention, Treatment and Rehabilitation of Victims of Torture and their Families (CPTRT) – the web page is www.cptrt.org . In this we work on the most difficult issue of human rights, that is torture, because in general the army and the police do not want to be accused of it. The other area in which we work is community work, so we have the Action Committee for Peace (COAPAZ), for which we work in 26 communities, where most of the participants are women from very poor barrios. That movement forms part of the Mother Earth Movement (MMT), which is part of Friends of the Earth International. At the same time, we have this clinic which is for humanitarian services. We’re not welfare assistants, we work with the grassroots in social organisation. Also we’ve done a lot of work on mines, studies in mines, clinical studies in difficult cases of displacements of campesinos and indigenous peoples, and of police and military brutality. On a personal level, we write a lot on the environment, human rights, political history, and our activity is very intense. The question of human rights we see from the human and politico-social perspectives. Personally, I hold an ideological position which is anti-imperialist and anti-capitalist, and we are fighting against what can be called the military agro-industrial complex. We have worked in the area of knowledge and the area of practice. We work in prison, a tough and historic work in the prisons because they are cauldrons of injustice. There’s a team, there are materials, there’s a whole series of things produced. That’s through CPTRT. The CPTRT has a big team of people, thirty people at full time, it’s an institutional work in which we have to follow an institutional mandate. Our central work theme is torture, medical attention and psychological care, but we also make denunciations, do case monitoring, and there’s an interdisciplinary team: lawyers, sociologists, social workers, medics, psychologists and social communicators. At the beginning it had a medical and psychological focus, but now it has a community focus. We are based here but we work in rural communities. We have two types of work: first, you have to see work with the most violent communities of Tegucigalpa; we are in Nueva Suyapa where we have a really strong programme in the community – we’ve been there for several years. Second, we’ve serviced MUCA (the Unified Campesino Movement of Aguán) where there is a social project. We were in almost all the fincas taken by the MUCA. The hardest movement is the problem of how to respond to them – it’s the fundamental campesino problem right now and the riskiest problem. In fact, they nominated us as the representatives of MUCA for the Verification Commission of the Human Rights Committee. We are also in the SARA Movement – that is the Movement for Food Sovereignty and Agrarian Reform. We are part of that movement which is a campesino movement. It’s a part of Vía Campesina and other organisations. We’re in the Political Commission of the Let’s Go With Grains Campaign in which there are a number of organisations making up an agrarian platform. We’ve also contributed to the organisation of human rights in Honduras, the platform which has promoted the Truth Commission. There are six of these organisations and the work is collective – there’s no one organisation which represents it, rather it’s a uniting of organisations. In the Centre we have been the object of several attacks. We have had to move and change office, and right now we are in another place, partly because of the rain and also because we’ve had some personal threats. We try to keep a low profile and in the reports we try to be as objective as possible and as close to the truth as possible, with the aims of satisfying the responsibility ethic and of not losing institutional credibility. More or less that is the CPTRT. As for the Mother Earth Movement, here in 2008 Friends of the Earth organised its world meeting in recognition of the work done by the Mother Earth Movement, and the theme was sovereignty and climate change. It was in Tegucigalpa. There were 800 delegates at that meeting and the organisation was really popular. We did it in the mountains in …?? ?… and women from the barrios did it all. They won an international prize for the work. We’ve worked on mining for more than ten years and are in contact with the Environmental Committee of the Valle de Siria and we’re also part of the Civic Alliance for Democracy which is another organisation which has protested against mining. The anti-mining protest here has been very strong. At the moment it’s changed a bit because of the coup. We have also worked against the transgenics. With Monsanto our work is to mobilise marches and participation, to denounce and also to research. Mother Earth is forest, water, a whole series of things, and it’s a campesino issue. In COAPAZ we have …?? ?… relatives. There’s community social work and in the clinic we use alternative medicine. I’m a medical doctor, a physiologist. I studied in the University of California and in the University of Pennsylvania. I’ve been a professor, a rector, a dean, various things, so we are very absorbed in this. And now with the coup we are very much into the Resistance. We also try to keep a low profile, not for any particular problem, but because of security. We’ve had a lot of threats and attacks. Martin Mowforth (MM): Have the threats increased since the coup? JA: Perhaps in some circumstances. What happens is that we are well-known in the country and we have many international links. But, yes, it has happened to us. For example, we had to cancel the telephone for four months, four months without a telephone. They had got into all our systems. For example, at the moment they have tapped my whole system. I’ve lost all my contacts, I’ve changed my email, I’m rather isolated, the telephones I have are tapped. They cut our water for almost a month, and it’s not a question of not paying. They’ve loosed off some shots at us and they’ve threatened all the team. Well, at least I can send what I write which are strong statements against the army and we try to promote the Resistance. But I’m not really on the scene because when I am on the scene I’m in danger because they see me as an ideologue. So we try to keep a relatively low profile. MM: What’s your analysis of the current situation of the Resistance and the movement to promote the new Constitution? JA: I think that there’s no doubt that the Resistance is the strongest and most popular political movement in the country. It’s not been easy from below, there have been a lot of repression, threats and assassinations. Not just the leaders have been assassinated, but also their families and relatives. For example I don’t have any contact with my family, and if I do it’s very limited, very short. It’s a very tense situation. But despite that, the Resistance is very strong in rural communities and with the campesinos. I’ve been involved in the whole process since the Resistance first arose. The Resistance was formed almost the same day as the coup took place, when we were facing the army troops. Under that tension the Resistance was formed by various organisations. It’s a very plural movement that involves all sectors of society; it’s a movement which dialectically engages the coup and helps to unify the people; it’s a positive thing that has come from the coup. The coup gives us many negative things, but the positive side was that it has facilitated the organisation and unity of the people, and not solely those people on the left, but all sectors. So the Resistance was formed as a plural movement which takes a non-violent line. So it included people of every tendency: Marxists, liberals, even conservatives. There were also the supporters of ex-President Zelaya, people from popular social movements, christian grassroots organisations, the LGBT which is a group which has become acceptable because here there was a terrible discrimination against them because of the prejudices influenced by religion; feminists in resistance, artists in resistance, human rights organisations. There is everywhere a coming together of organisations which managed to constitute a type of front, a front which at the beginning didn’t have a very clear form, but which after a while became well defined. Since the start it has had good leaders, straightforward people who have had more than a year of taking part in marches and protests. In the process it has pulled down many of the country’s plans: for example, the church hierarchy has been broken by the demonstration of its corruption of the rejection of the Cardinal who is a figurehead who is representative of religious values. The same occurred in the evangelical church which has had leaders who have been strongly in touch with the class struggle – that is to say, the unity of capital with work. That situation also takes us to broach the media question. The media have had an extraordinary influence on an uneducated people. But come the coup and the people realise who is on their side and who is against them because throughout the whole process we’ve been seeing that the oligarchy is brutal, through the alliance between the oligarchy and the church and the alliance of the oligarchy with the military. All that has brought about a unity amongst the people. At the beginning there was a lot of excitement. We were opposed to President Zelaya because I was the presidential candidate for the left. At that time, we didn’t think that Zelaya could get to the point where he would take a very progressive stance. So we had differences, but in the process we prepared ourselves for the coup. The Resistance nominated me as delegate to go to the State Department, to take part in dialogue and in September we had a trip of condemnation of the coup. We’ve been asked: What is the ideological principle of the Resistance? What’s the Resistance’s strategy? What is the future of the Resistance? How are you going to create a National Constituent Assembly? At the beginning, we only saw police brutality, the use of terror, mass torture. Our information reveals that before the coup there were around three torture victims per month, but immediately after the coup there were 119 torture victims. I’m saying it’s only our information because it has been medically and psychologically certified, based on the Istambul Protocol – that is to say, very rigorously. There has even been torture taking place in the parking lot of the Congress building, in the military grounds, and in various other places. What I want to say is that the Resistance has formed itself in response to the people, not just because it’s a political crisis but also because it’s a social crisis. There is not only a difference in the traditional political ideas, but also the Resistance is formed as an expression that results from a yawning ideological and political gap which generates a lack of credibility in the church, in the media, in the army, in the police, and in the normal social structures. The Resistance is filling that gap. The Resistance has its major expression in the urban centres of Honduras, in San Pedro Sula, in various places along the coast, in Tegucigalpa, but it’s not a purely organic issue. But lately it’s been becoming more organic, especially in the barrios. When they repress us in the streets of Tegucigalpa, the Resistance organises demonstrations in the barrios, despite police actions. It’s very difficult for the army to control all the barrios. So there’s a mixture of the traditional values of the people who aren’t so politicised, for example like the people of Nicaragua or El Salvador. But they are a people who have been stigmatised as cowards or lacking values, even as being leftists, …?? ?… But in fact they are a very courageous people. At the moment, the Resistance is perhaps the strongest movement in Latin America. We’re talking in relative terms, but this movement has managed to move a million people. MM: What are the possibilities of changing the constitution? JA: With that you have to consider the whole process. First, it’s a process ignored by the political-military apparatus which is radically opposed to it and for which supposedly that is one of the reasons why they kicked out Zelaya. Legally, through the media and through religion they create a filter against a National Constituent Assembly. Now, what possibilities exist? At the moment the coordinator outside of the Resistance is President Zelaya – he is the spirit of the leadership of the National Constituent Assembly. I believe that we fill the ideological vacuum in the people, but we don’t fill it with an ideology. It’s a process which takes time, resources, training. There’s an anti-imperialist and anti-capitalist sentiment, but there isn’t a political development or formation. We need to fill that space but with a leadership to go with the development. People are waiting for ideological and political direction which is happening to some extent, but perhaps not with the necessary speed because of the lack of resources. We have a leadership which has been sacrificed for self-denial, respect and dedication, but we need it [leadership]. The other thing is that we’re talking about mobilisation, and from that comes the debate about whether the Resistance should be a political party or if it should be a broad front. The other question is if the Resistance is a front for the mass of people, of course not fascist, but anti-imperialist and anti-capitalist, still we are not there. I’m not talking in the name of the Resistance, only on a personal basis. We need to build a peoples’ front because there’s a very important question that refer to the material relations with life. I believe that the material issue is not separate from spirituality. We need to consider that connection with life, of the material, of the cultural and of the spiritual. This means that we need to fill the space which the church has left in all these sectors, because first it seems to me that there is an emotional phase of sympathy, which we can call a honeymoon; but afterwards we have to take concrete actions with which the Resistance may make changes and transformations which the people can see. For example, in your events and propositions you oblige the system to make various changes to satisfy some real necessities that the people have. It seems to me that that is fundamental in the process of construction. 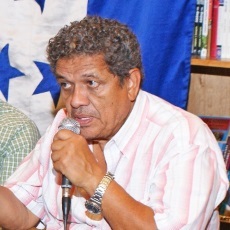 For example, we have an agrarian problem which is fundamental in the country and which is unjust to the campesino sector; so the Resistance can support the events or propositions of campesino organisations which are emerging through an agrarian transformation and they can do that in a National Constituent Assembly. This is a mechanism – we don’t see it as a legal mechanism, but as part of a process in which the people take power. That is to say, the people decide not only to build a Constitution but also to transform it. This is a fundamental point. It seems to me that at the moment we have policies which are all destructive and criminal and that the priority which is emerging is in favour of the private over the public. So it’s necessary for the Resistance to have all these ideas and positions worked out and to take them to the people as ideas and positions for change. We lack that. The scheme for the Assembly is one of the Resistance’s priorities, but that requires a lot of work, including the theory, the philosophy, the politics, the ideology, to build the transformation of the Constitution, of the system. People haven’t lost their enthusiasm for the Resistance. Yes, we need to build in order to get there, it needs to be worked at, but we lack that at the moment. Remember that we are a country that is militarily occupied by the United States; the whole dynamic of counter-insurgency is very strong here and the army is advised. The whole ideological apparatus of the state and of the international community is trying to present a scenario in which Honduras is a country where there is democracy, where there is dialogue; but on the other hand it’s repressive. In that sense, education is fundamental. I’m talking of education for liberation, not simply formal education. It’s also very important to share experiences and solidarity. So, the possibilities of a Constituent Assembly you can see them in the dynamics of the situation, because the government could be interested in such an Assembly because it’s such a need felt by the people. But they [the government] are thinking about the Constituent Assembly not to change the representativeness of power but just as a popular demand. We are thinking of changing the whole system to generate a process of change in the country. So the possibilities are difficult, but we haven’t abandoned them – it’s one of the priorities of the Resistance. MM: In the long term is it feasible for the Resistance to take part in the next elections? JA: Well with that there are very different positions – there isn’t just one single position within the Resistance. I’ll give you my point of view. I believe that the Resistance must not become an electoral political party because that would weaken the Resistance. The right wants the Resistance to become a political party and to take part in the elections. With that end they are encouraging different sectors to take part in the elections. We must recognise that historically Honduras was a country which didn’t have elections for 18 years. In the 1980s, we began to get elections and there was an almost cultural enthusiasm for them. But the Resistance could lose its major objectives if it turns itself into a political party. From that, the Resistance has to think like a political force, it has to plan strategic objectives and tactics with the aim of bringing about changes and with the aim of allying itself with the Latin American people, but it has to have objectives which go further than a political party. From another point of view, elections divide and create individual aspirations and fictitious leadership. I believe that in reality the people have to be the drivers of the Resistance rather than a leader. The idea is that there should be a collective direction, not a traditional direction. Now, whether the Resistance can support a political force in an electoral process, that’s another thing. We don’t deny that that possibility exists and I think that it should not abandon any possibility or any space in the political field. Through discussion, the Resistance could support a political force which would compete in the elections, but its objectives must go beyond the elections because historically elections in this country have given rise to distortion, corruption and a whole host of things. So, what would be the other characteristic of the Resistance? Well, it could be a political force that at this current moment concentrates on the National Constituent Assembly and which through that could develop other characteristics of a political force. In that sense, it could be a broad front, it could be a patriotic front, a force to transform society. Obviously, it has to put itself forward in order to take power – that’s logical – but it’s lacking a lot right now. In the Resistance there are many political forces which have even taken part in elections and yet they are good colleagues. I’m a supporter of unity, without excluding any strand – the indigenous peoples, black peoples, parties which traditionally have been part of the Resistance, in the democratic unification. Right now I’m not a supporter of any particular sector, rather we are all involved in building a Resistance which has a collective direction and we don’t hide our sympathy with people in other Latin American liberation struggles – we are in solidarity with Cuba, with the people of Venezuela, Ecuador, the whole process in Bolivia – we must protect the Bolivarian process which has a rich philosophical background. MM: Can you bring me up-to-date with what is happening in the Aguán valley? JA: In the Aguán valley you have to understand that there’s been a history of land conflict. In the first place, a campesino associative company was founded there. It was called the Associative Company of Small Islands (Empresa Asociativa de Isletas) and was a collective company[ – like a cooperative]. But it was a brow-beaten company because it obliged the campesinos to sell their land. And the right wing demanded that position of the campesinos. They had created a situation of terror and there was a military intervention, assassinations of campesinos – a whole series of things at that time. But in that zone there were groups of campesinos and also migrants. Some leaders had emigrated from the countryside to the city in the hope of finding an organisation. So there’s a period when the campesinos were selling their lands and Facussé bought them for a price, as they say here “de gallo muerte” [the price of a dead cockerel] – that is to say, extremely cheaply. And he also took over various lands of the state and grew African palm on them. Now obviously we are against agrifuels [biofuels]. Now, we must ask ourselves how a campesino movement arose and seized force during the period of the coup. It has to be with very brave and organised people to be able to take control in such a fixed way that they managed to recover land. There is a group, Guadelupe Carney, a historic group, which has been in various places close to the Aguán for years. It’s the Unified Campesino Movement of the Aguán (MUCA), which is a number of organisations, sectors and families who have organised themselves to reclaim their land, to survive or die. The movement reached its climax during the coup d’état. A situation of tension was created there, near Nicaragua and the Caribbean. It was a zone of military testing, heavily militarised, and before there was a battalion there. Now it’s near a North American military base. In the midst of all that MUCA developed. MUCA’s aim is to occupy lands belonging to Miguel Facussé, René Morales and Reinaldo Canales who are the big landowners with thousands of millions of dollars. Moreover, the World Bank is developing there the cultivation of agrifuels (biofuels) as recommended by the [US] Embassy. It’s a project which was not originally associated with the campesinos, but what we have to take into account is that the campesinos have occupied land that is already cultivated with African palm. That’s the crucial point – they don’t know anything about African palm, but they occupied relatively large areas of land. Faced with the production of African palm, they had two possible situations: not to buy it, but then they don’t process the palm, not in sufficient quantities. So Facussé created his own army. We have to see that here the private army is a major force. We are talking of more than 60,000 armed men, larger than the Honduran army. That’s not just what he has in the Aguán, but this figure is made up of all the private forces in the country. There are hitmen in a very tense situation. It’s not just Facussé, I’m referring to all the private guards in the country. Here we are watched by the army, by the Pentagon, by private guards and by hitmen. So the conflict develops there and the danger is such that a civil war could develop. There have been many deaths. They manage to tell the government, “We are not going to let you enter here.” They negotiate, they sign an agreement in which they have to deliver lands, they demand health services, education and housing, because it’s an abandoned zone. Those people live in houses of plastic, at high risk and in danger of flooding. At times they are very heterogeneous groups, with a history of struggle, and they have great strength. Then there are contradictions in the system because the landowning oligarchy is radically strong. The government is from the right and was participating in the process, but the oligarchy is the most radical force there, more radical than the government. Well, these forces, the oligarchy, don’t want to let the campesinos get a hold. But they have gained a very big political space and the threat of the army’s massacres are there. When we go to these barrios/colonias there’s a lot of tension because we have accepted an extremely delicate mission – the struggle against the ultra-right wing. So I’m not sure how it is going to turn out. There is still conflict which isn’t resolved. The land problem is still ongoing, and still it has not been delivered to the campesinos. But that is just an appendix to the campesino problem which goes beyond MUCA. It’s the community of Guadalupe Carney which has been beaten down. They are the campesinos from other regions of the country where there is no agrarian reform. Here the law of agricultural modernisation rules, and that destroys agrarian reform. That’s a part of modernity, of capitalism. I’ve written about 15 articles on the campesino problem.